Each year 19 August marks the day, in 2003, when the UN Headquarters in Baghdad, Iraq were bombed and 22 people lost their lives. 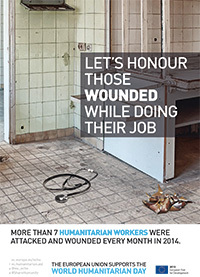 Ever since, the World Humanitarian Day is an occasion to commemorate the brave men and women who risk attack, injury and death in humanitarian service. 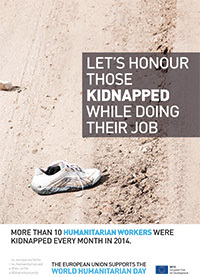 Killings, kidnappings and attacks are dangers humanitarian workers face on a daily basis. Over the last decade, the risk humanitarians face of being attacked has significantly increased. Violence and insecurity prevent the delivery of humanitarian aid where help is most needed. 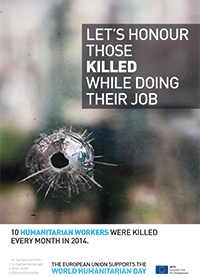 Every month in 2014 on average more than nine humanitarian workers were killed, more than seven humanitarian workers were attacked and wounded and ten humanitarian workers were kidnapped. This alarming trend was highlighted in the Aid Worker Security Database, which is dedicated to recording major incidents of violence against aid workers. The World Humanitarian Day is an opportunity to reach out to as many people as possible to inform them about the work humanitarians do when providing life-saving assistance to victims of conflict or natural disasters. It is a day when people all around the world can get involved, stay informed and engage in creating a more humane world. See how we supported World Humanitarian Day in 2014. During the month of August, coinciding with World Humanitarian Day, 'humanitarian aid' is the thematic focus of the 2015 European Year for Development. See more about the Year and visit the website.